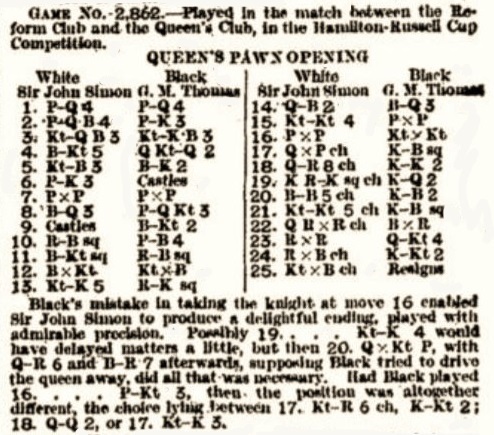 “In his book A Century of British Chess, newly published, Mr Philip Sergeant repeats the assertion that Howard Staunton, ‘the father of British chess’, was treated ungenerously by his father, the fifth Lord Carlisle. 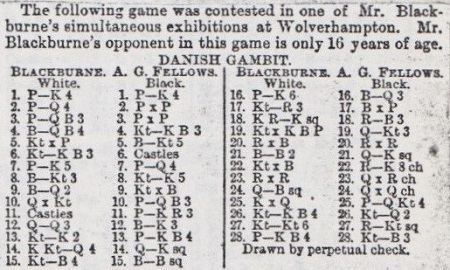 The first game is discussed in the feature article A Brilliancy by Hermann Helms. 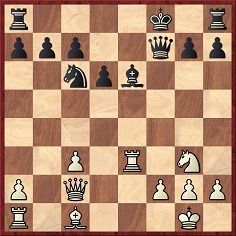 1 e4 e5 2 Nf3 Nc6 3 Bc4 Bc5 4 b4 Bb6 5 a4 a6 6 a5 Ba7 7 b5 axb5 8 Bxb5 Nf6 9 Ba3 Nxe4 10 Qe2 Nxf2 11 Nxe5 Nd4 12 Nxd7+ Nxe2 13 Nf6 mate. Although most of the column is a report on a lightning tournament at the Marshall Chess Club, there is a change of topic towards the end. 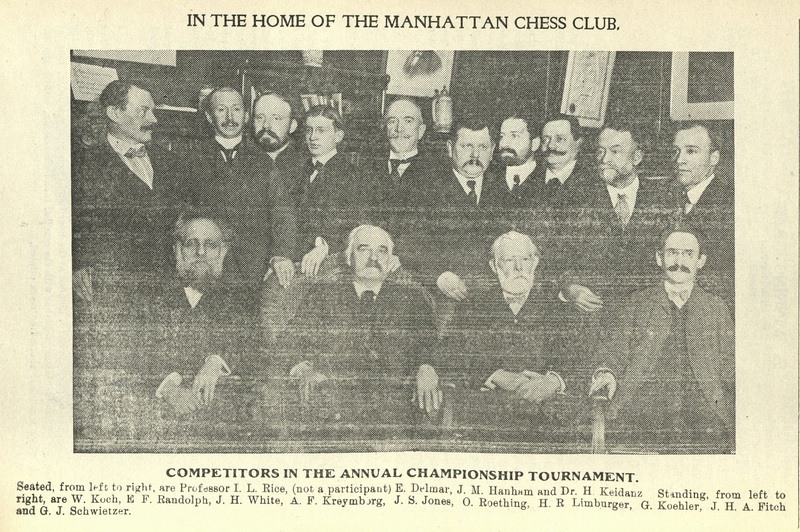 Helms does not specify whether his game against Tenner occurred in a rapid-transit competition, as opposed to being an off-hand encounter, but does state that the venue was the Manhattan Chess Club. 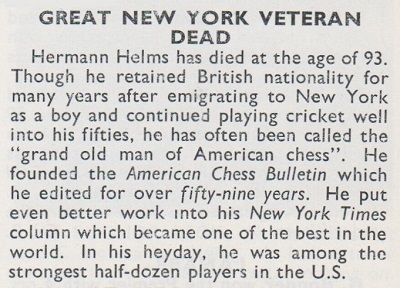 Further to the description of Hermann Helms on page 8 of the New York Post, 14 February 1942 as the ‘dean of the American chess press’ (C.N. 10786), we mention, firstly, a fine, extensive tribute to him (‘the undisputed Dean of American Chess’) by Frank Brady on pages 3-4 of Profile of a Prodigy (various editions). 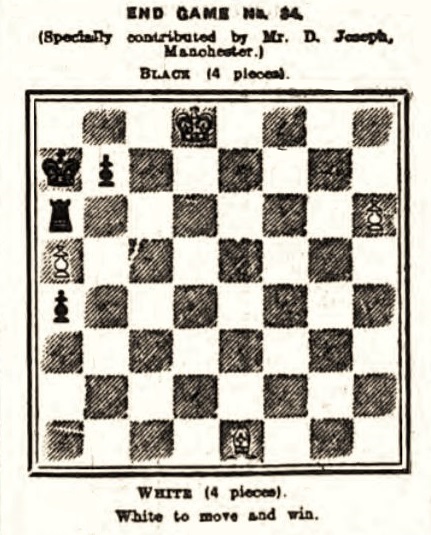 As shown below, however, the word ‘undisputed’ may be disputed. 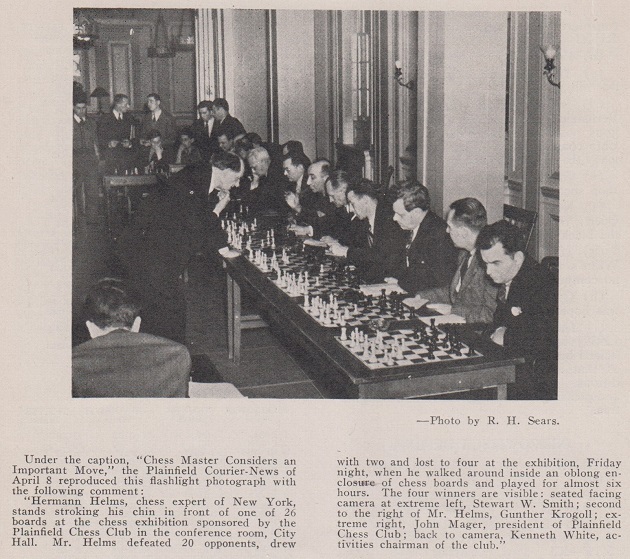 In the previous decade, versions of the title accorded to Helms were more limited, such as ‘the dean of American chess writers and publishers’ (Morning Call, 29 January 1933, page 10). 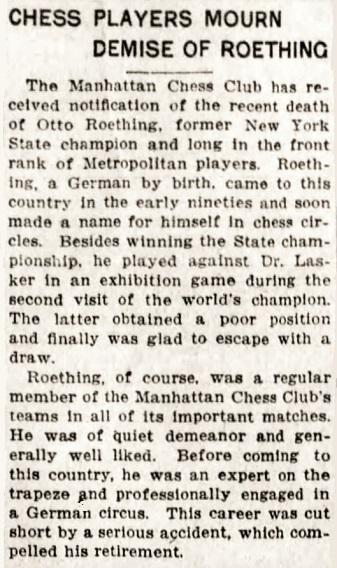 The Cincinnati Enquirer of 12 November 1933 (page 2, section IV) wrote concerning Helms, ‘we believe he is the dean of American chess editors in experience, service and possibly age’. 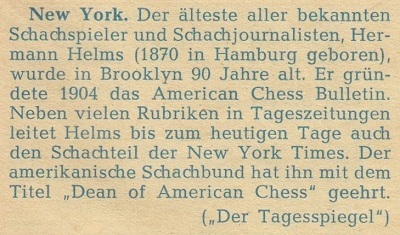 Before the ‘official title of Dean of American Chess’ was conferred on Helms, similar titles had been given to others. 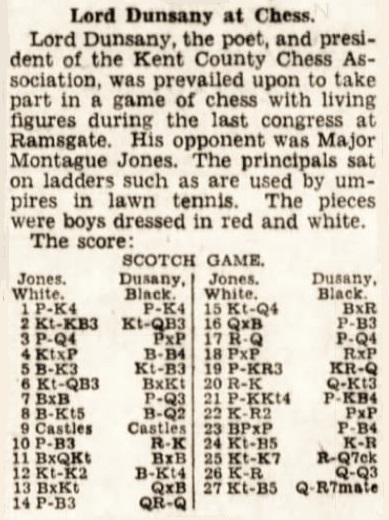 Page 11 (Sports section) of the 25 August 1922 New York Times called Jackson Whipps Showalter the ‘dean of American chess players’. 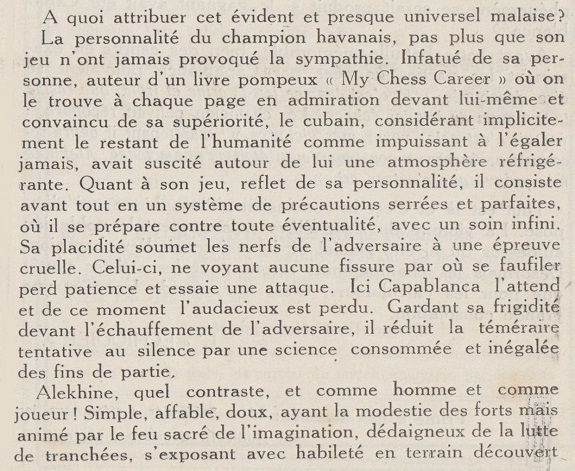 After publishing a letter from Walter Penn Shipley about Albert Beauregard Hodges, page 169 of the October 1941 Chess Review had an editorial note which began: ‘Rival candidate to the title of Dean of American Chess, octogenarian Shipley is a few years [sic] older than Hodges ...’ On page 168 of Capablanca’s Best Chess Endings (Oxford, 1978) Irving Chernev called Shipley ‘The Dean of American Chess for several generations’. 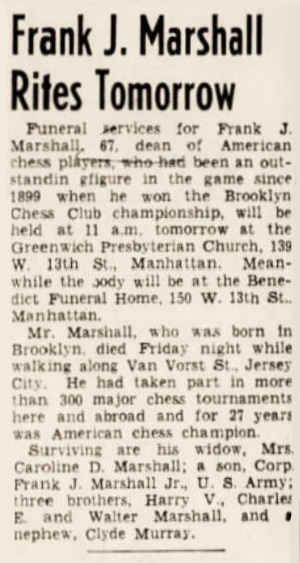 Page 67 of the March 1943 Chess Review referred to Frank James Marshall as the ‘Dean of American Chess’. 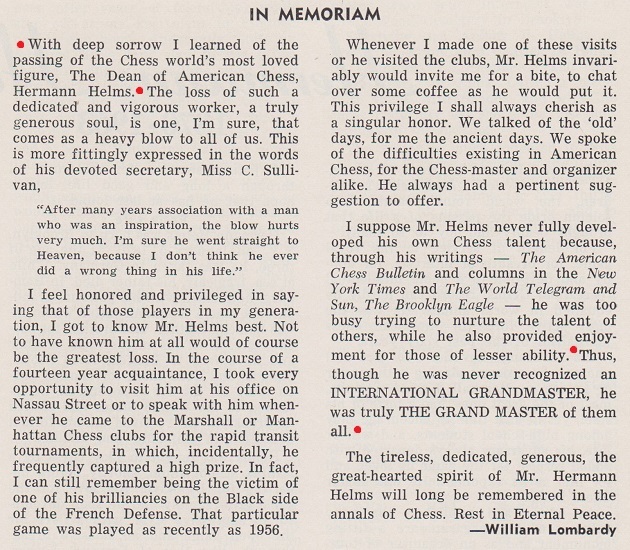 Marshall, incidentally, was a speaker at the dinner at which the title was bestowed upon Helms (American Chess Bulletin, September-October 1943, page 73). 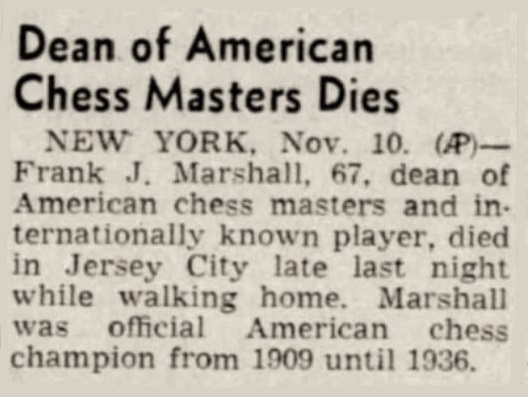 Reuben Fine was incorrect when he wrote on page 190 of The World’s Great Chess Games (New York, 1976) that Marshall ‘remained the dean of American chess until his death in 1943’. 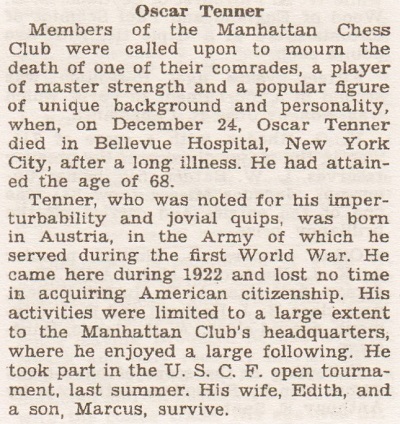 On page 5 of the January 1946 Chess Review Fine applied the term ‘the dean of American chess masters’ to Edward Lasker. 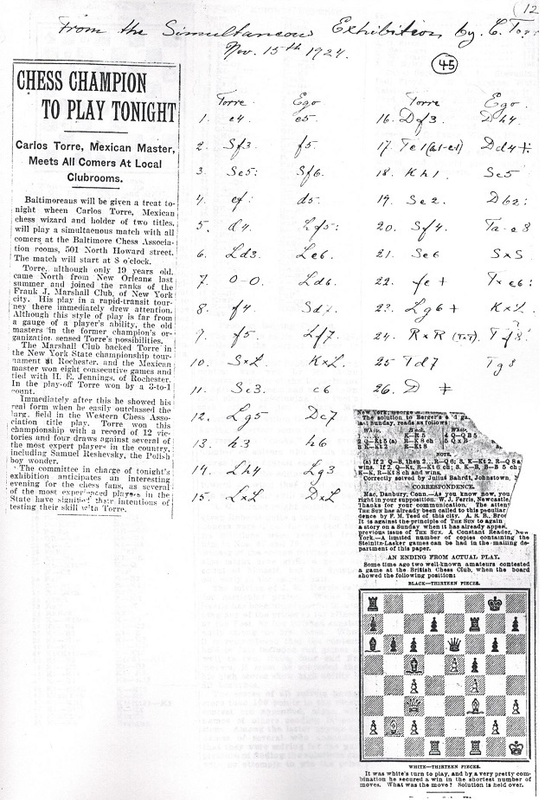 A brief tournament report on page 4 of the August 1947 Chess Review called Lasker ‘Dean of American Masters’ and Helms ‘Dean of American Chess’. How much significance or value the ‘dean’ title ever had is another question. 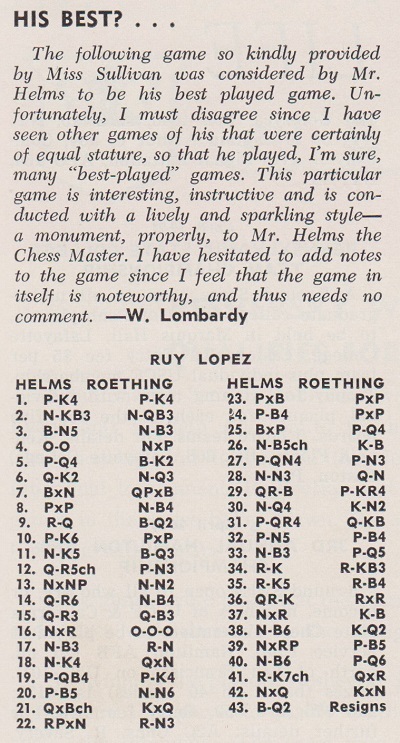 As regards the perks, if that word is not too strong, on page 33 of the February 1963 Chess Life John W. Collins referred to Helms as ‘the Dean, an Honorary Member of all clubs in the United States’. 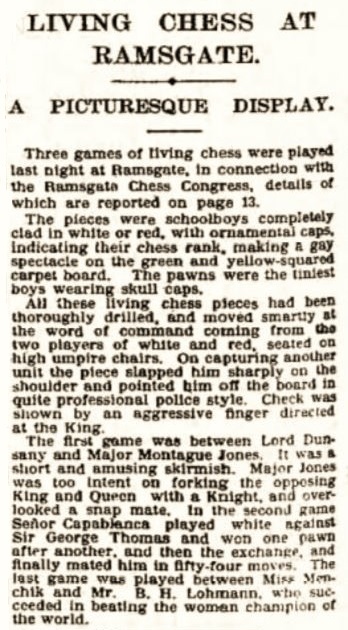 The brief notice of Helms’ death on page 72 of the March 1963 BCM had no geographical restrictions: he was ‘the doyen of all chess journalists’. 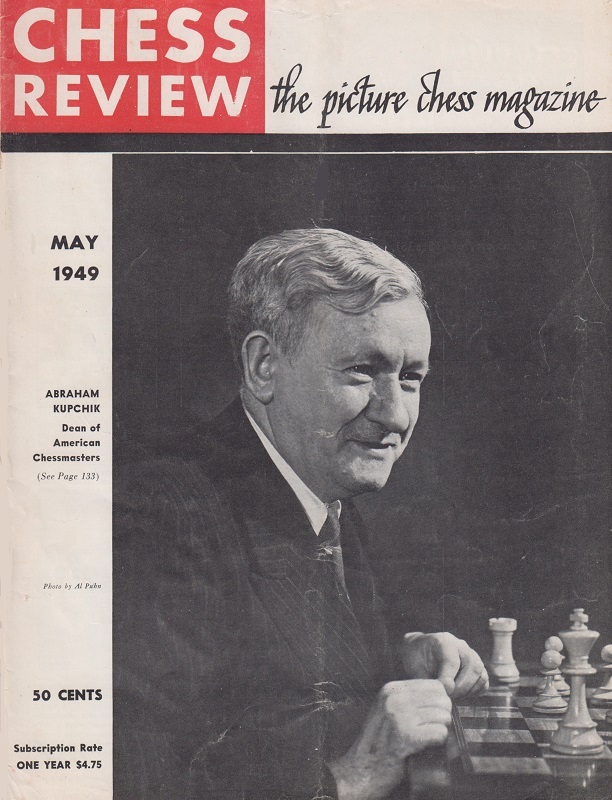 ‘Because he was the dean of the chess world for 30 years Tarrasch’s vices and virtues have been magnified out of all proportion.’ Reuben Fine, on page 12 of Chess Review, March 1944. 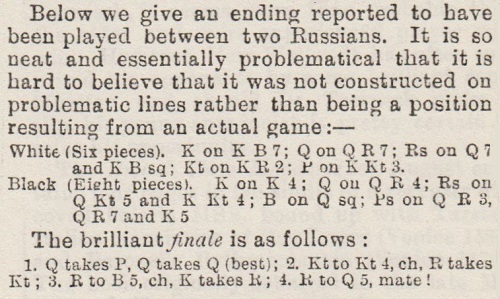 The same text is on page 62 of Fine’s book The World’s Great Chess Games (New York, 1951). 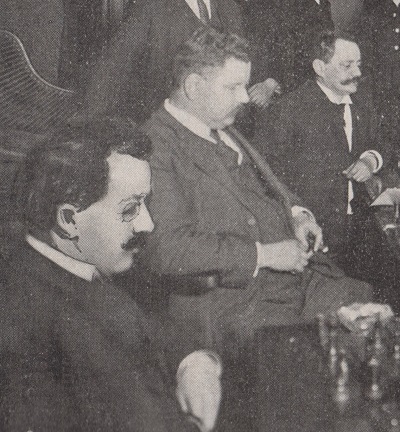 ‘... the inimitable dean of modern chess masters, Dr Savielly Tartakower.’ Reuben Fine, on page 169 of Chess Marches On! (New York, 1945). ‘... 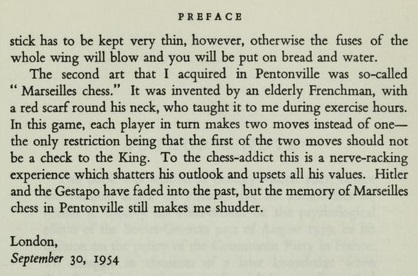 The dean of present-day masters is Jacques Mieses, who is still going strong at 83.’ Reuben Fine, on page 125 of The World’s a Chessboard (Philadelphia, 1948). 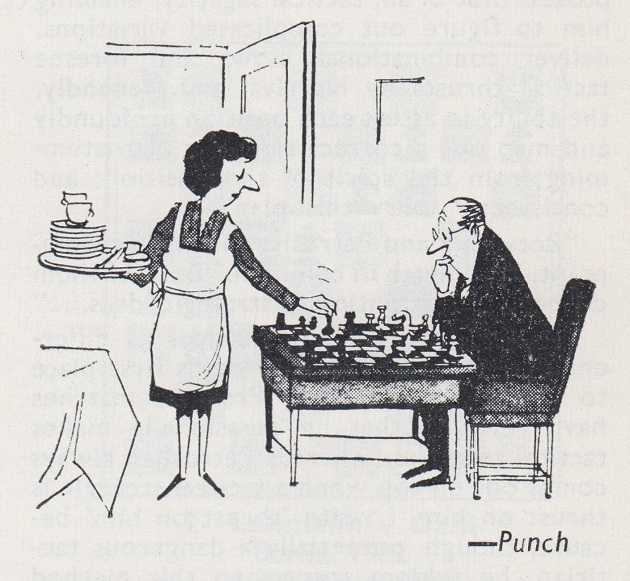 A reference to chess by the brilliant BBC broadcaster Eddie Mair. 10795. 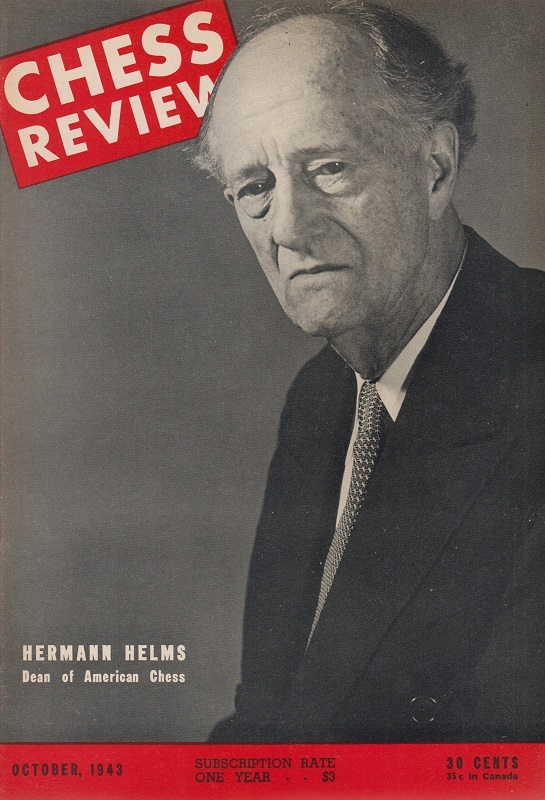 Where was Hermann Helms born? 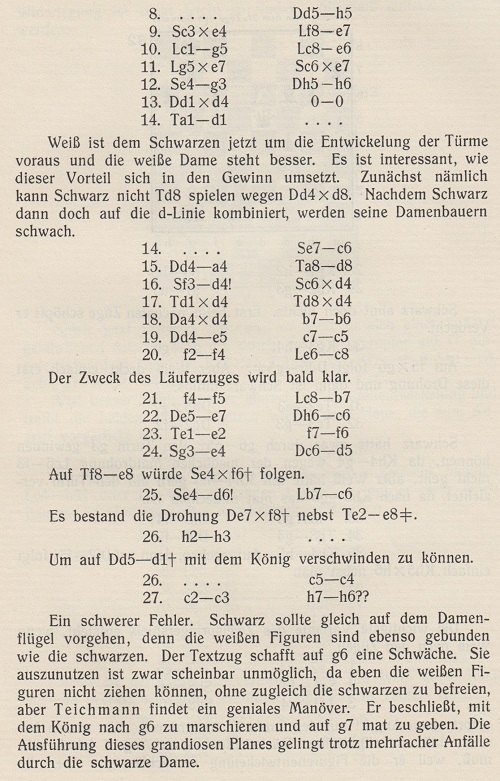 CHESS, 25 May 1963, page 257. 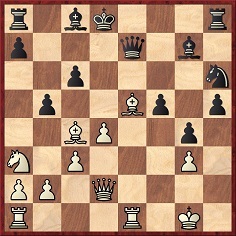 20...Ng3 21 Qxd7+ Kxd7 22 hxg3 Rg6 23 cxd6 cxd6 24 f4 exf4 25 Bxf4 d5 26 Nc5+ Kc8 27 b4 b6 28 Nb3 Qg8 29 Rac1 h5 30 Nd4 Kb7 31 a4 Qf8 32 b5 c5 33 Nf3 d4 34 Re1 Rf6 35 Re5 Rf5 36 Rce1 Rxe5 37 Nxe5 Kc8 38 Nc6 Kd7 39 Nxa7 c4 40 Nc6 d3 41 Re7+ Qxe7 42 Nxe7 Kxe7 43 Bd2 Resigns. 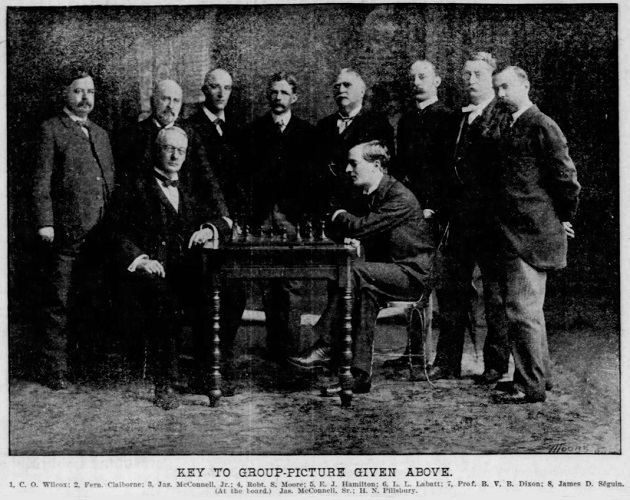 Eduardo Bauzá Mercére (New York, NY, USA) points out that the game was played in the first round of the General Tournament of the New York State Chess Association on 22 February 1894 and was published in the Brooklyn Standard Union the following day. 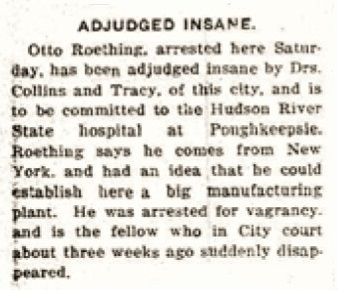 Brooklyn Daily Eagle, 15 August 1915, section five, page 3. 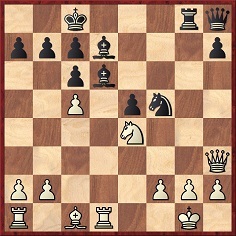 1 e4 e5 2 Nf3 Nc6 3 Bc4 Nf6 4 d4 exd4 5 O-O Nxe4 6 Re1 d5 7 Bxd5 Qxd5 8 Nc3 Qh5 9 Nxe4 Be6 10 Bg5 Be7 11 Bxe7 Nxe7 12 Qxd4 O-O 13 Ng3 Qh6 14 Rad1 Nc6 15 Qa4 Rad8 16 Nd4 Nxd4 17 Rxd4 Rxd4 18 Qxd4 b6 19 Qe5 c5 20 f4 Bc8 21 f5 Qc6 22 Qe7 Bb7 23 Re2 Qd5 24 h3 b5 25 Kh2 (As will be seen below, there is no unanimity over the move-order in this phase.) 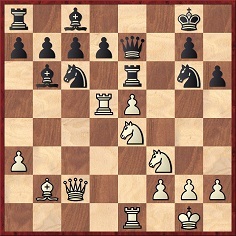 25...f6 26 Ne4 c4 27 Nd6 Bc6 28 c3 h6 29 Kg3 a6 30 Kh4 g6 31 Re3 Qxg2 32 Rg3 Qf2 33 fxg6 Qf4+ 34 Rg4 Qf2+ 35 Kh5 Qc5+ 36 Kxh6 Resigns. 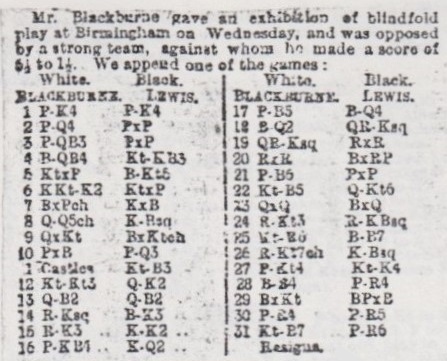 ‘It appears that the well-known game Teichmann v Allies, supposedly played in Glasgow in 1902, actually occurred there three years later. 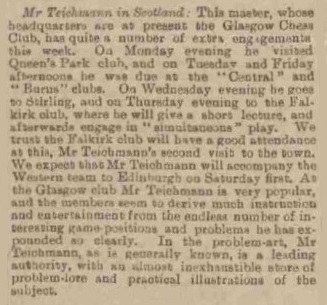 Friday, 17 March: Burns Chess Club. 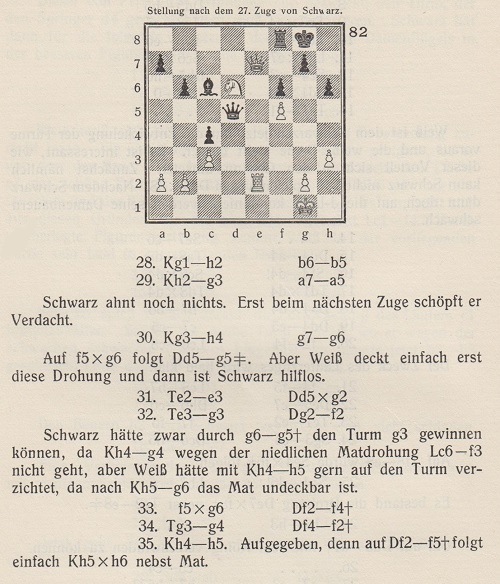 John Hilbert (Amherst, NY, USA) has forwarded us a photocopy of the game’s original publication, by W.E. 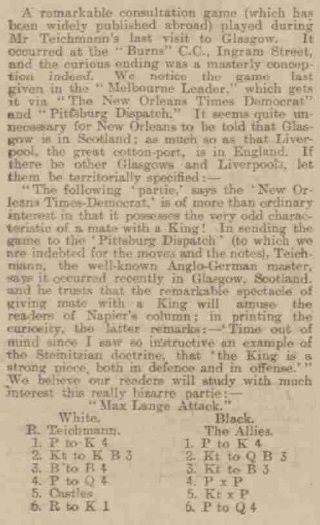 Napier, in the Pittsburg Dispatch of 5 June 1905. 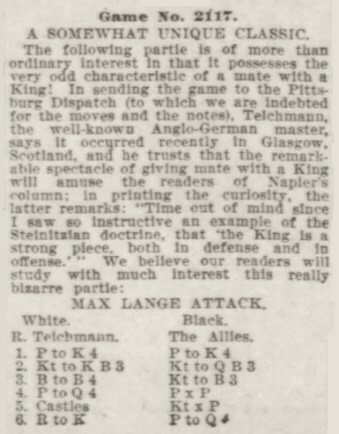 Teichmann had also visited Glasgow in 1901-02, for four months (BCM, February 1902, page 60), but Napier’s report of the communication from Teichmann indicates that the king-march game was played recently, i.e. 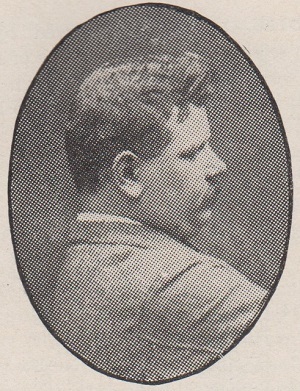 in March 1905. As mentioned in C.N. 7933, Beratende is a German word for consultants/allies. 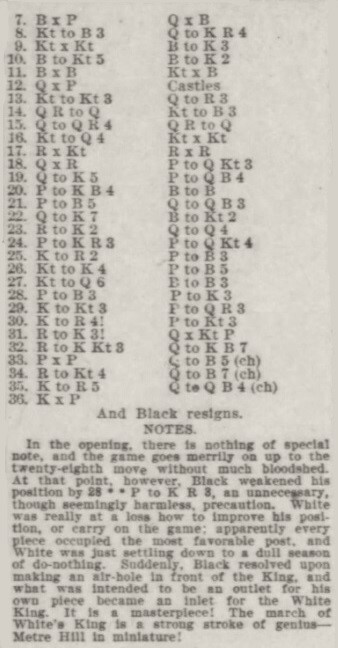 In Lasker’s final note, a move by the black queen to c5 (QB4), and not f5 (KB4), was evidently meant. 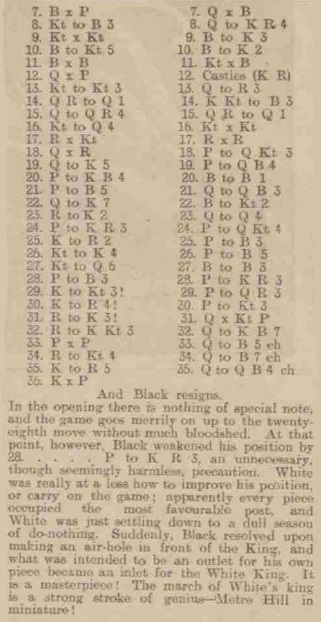 The move order given by Lasker included the sequence 28 Kh2, 29 Kg3 and 30 Kh4, as in the Pachman book but also, strange to say, as in item 114 of Unit Two of Napier’s Amenities and Background of Chess-Play (New York, 1934), which, moreover, had the date 1902. 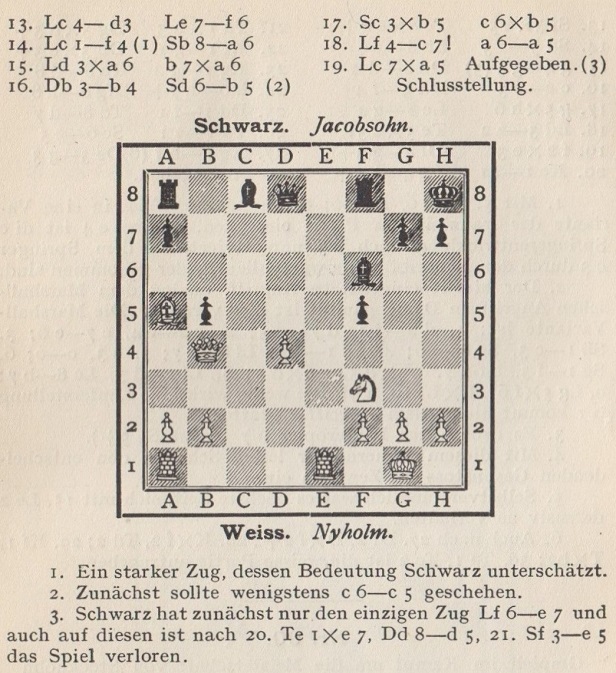 See too pages 167-168 of Paul Morphy and The Golden Age of Chess by W.E. Napier (New York, 1957 and 1971). 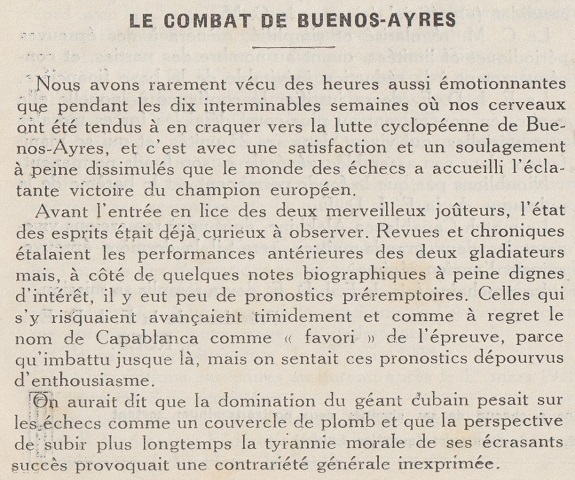 Source: Chess Amateur, October 1926, page 1. 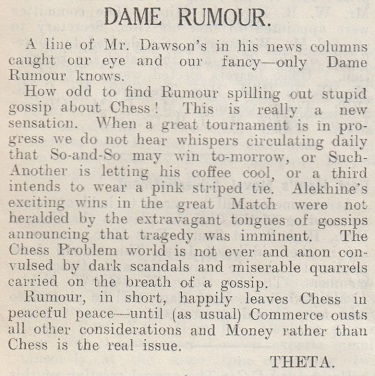 Source: Chess Amateur, July 1928, page 301. 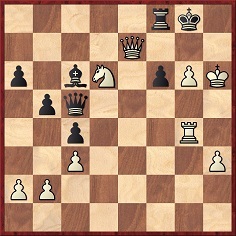 21...f5 22 Kh2 fxg4 23 fxg4 c5 24 Nf5 Kh8 25 Ne7 Rd2+ 26 Kh1 Qd6 27 Nf5 Qh2 mate. 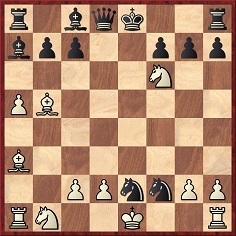 15 Ng4 cxd4 16 exd4 Nxg4 17 Qh7+ Kf8 18 Qh8+ Ke7 19 Rfe1+ Kd7 20 Bf5+ Kc7 21 Nb5+ Kb8 22 Rxc8+ Bxc8 23 Rxe8 Qg5 24 Rxc8+ Kb7 25 Nxd6+ Resigns. 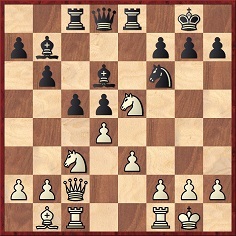 29 Re3 Rdc8 30 Nb3 Qb5 31 Red3 Qe8 32 Re2 Qc6 33 Kg2 Rg4+ 34 Kf2 Rh4 35 Ke1 Qb6 36 Rde3 Rf8 37 Qc3 h6 38 Kf1 Qb5 39 Nd4 Qd5 40 Re4 Rh5 41 Re8 Rxe8 42 Rxe8+ Kh7 and White wins. 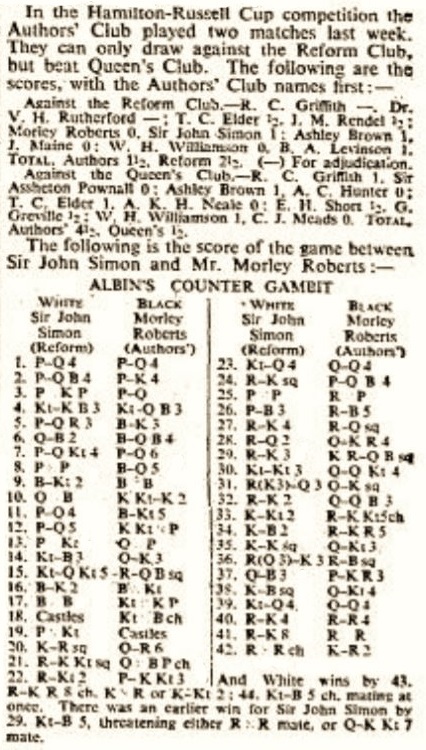 Alan Smith also notes that the game against Fairburn in our feature article on Sir John Simon was played on 19 November 1937, a report being published in The Times, 23 November 1937, page 19. 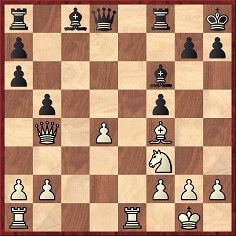 Which move has just been played? The unpublished 1994 edition had no further information. 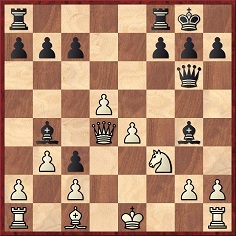 This position arose in a game in Sweden during the First World War, and White has just played 19 Bxa5. 18 Bc7 a5 19 Bxa5 Resigns. 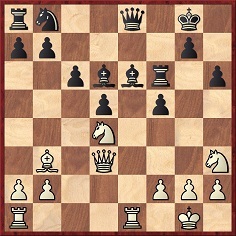 Eduardo Bauzá Mercére (New York, NY, USA) has created a game which reaches the requisite position by a different route: 1 d4 f5 2 c4 Nf6 3 Nc3 e6 4 Nf3 d5 5 e3 Bd6 6 Bd3 O-O 7 O-O c5 8 Re1 cxd4 9 exd4 dxc4 10 Bxc4 Nc6 11 Bxe6+ Kh8 12 Bc4 Na5 13 Qa4 Nxc4 14 Qxc4 Ne4 15 Bd2 Nxc3 16 Bxc3 Be7 17 Qa4 Bf6 18 Ba5 b5 19 Qb4. 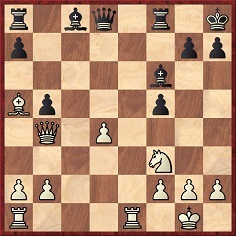 1 e4 e5 2 Nf3 f5 3 Nxe5 Nf6 4 exf5 d5 5 d4 Bxf5 6 Bd3 Be6 7 O-O Bd6 8 f4 Nbd7 9 f5 Bf7 10 Nxf7 Kxf7 11 Nc3 c6 12 Bg5 Qc7 13 h3 h6 14 Bh4 Bg3 15 Bxg3 Qxg3 16 Qf3 Qh4 17 Rae1 Qxd4+ 18 Kh1 Nc5 19 Ne2 Qxb2 20 Nf4 Rae8 21 Ne6 Nxe6 22 fxe6+ Rxe6 23 Bg6+ Kxg6 24 Rxe6 Rf8 25 Re7 Rg8 26 Qf5 mate. 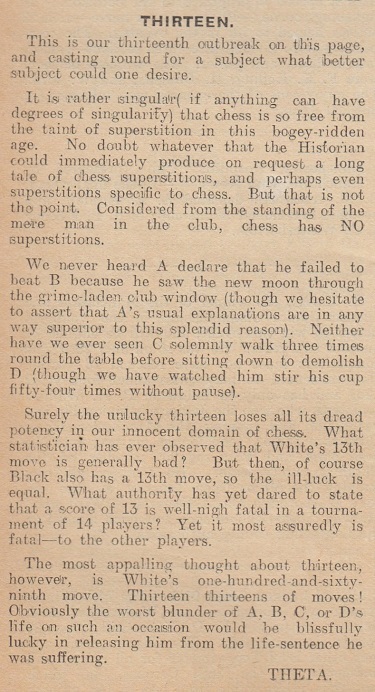 British Chess Magazine, March 1934, page 109. 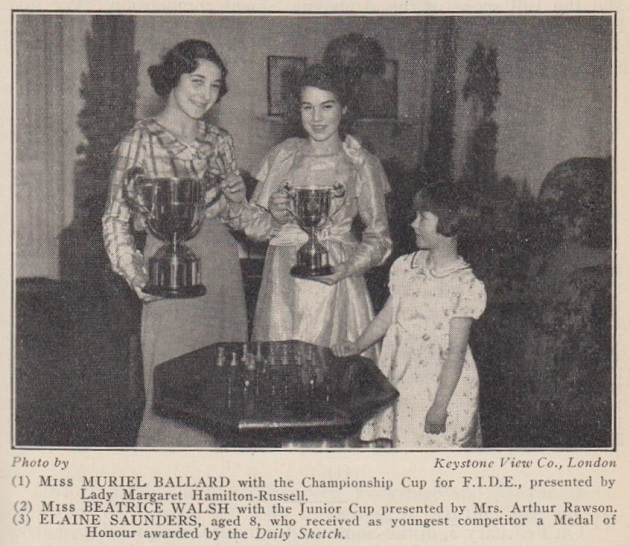 For further photographs of Elaine Saunders, see Chess Prodigies. 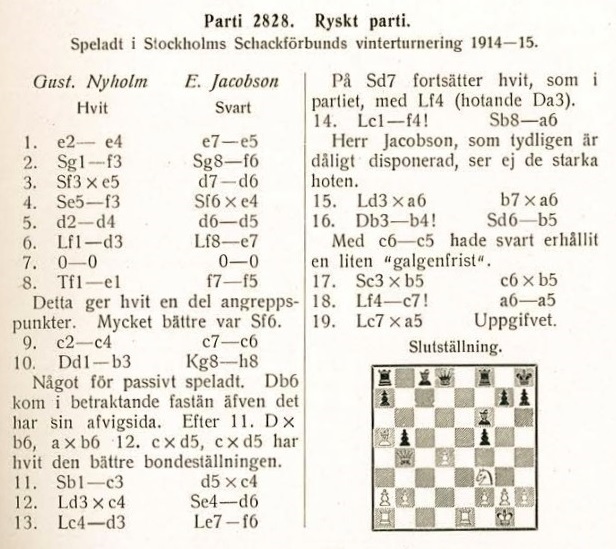 ‘It seems that John Donaldson gives the final word on this subject in his magnificent five-volume overview of Fischer’s career, published in digital form between 2015 and 2017. 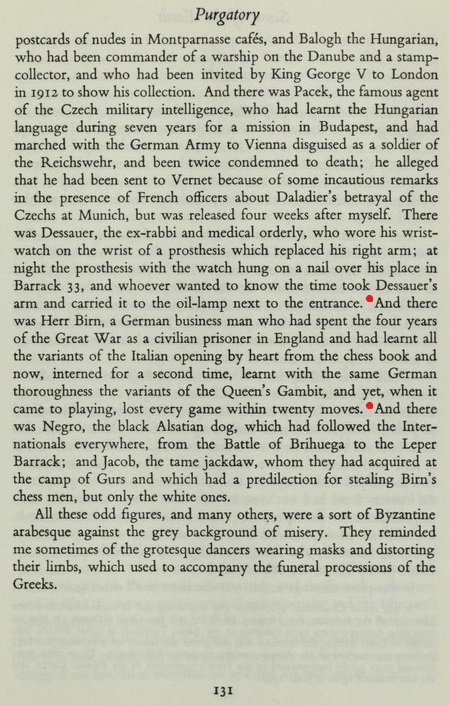 The third volume, Collected Annotations and Articles by Bobby Fischer (2016), describes the “big red book” and the Wade dossier in detail. 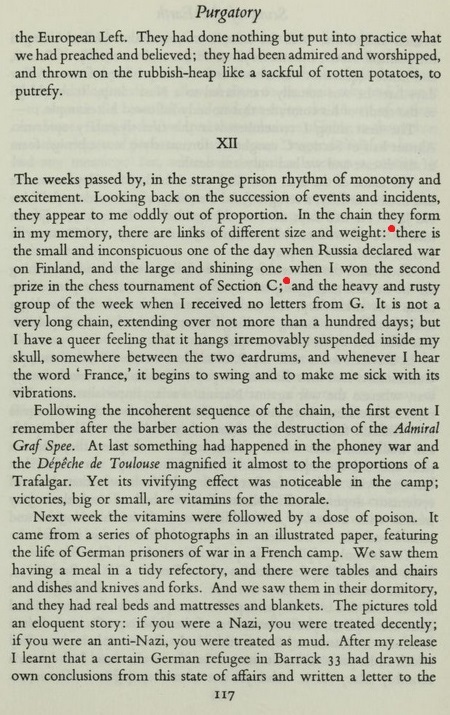 Donaldson also unearths buried treasure: handwritten, previously unseen annotations by Fischer in the book and the dossier. The Donaldson work is in digital form, not yet in print, and my citations reflect cumbersome “locations” in the e-version rather than page numbers. The key section, labeled “The Wade Files”, begins at location 6188. Donaldson describes a meeting with Kevin O’Connell, who explained how the Wade dossier was compiled to meet Fischer’s demanding deadlines. O’Connell noted that he and Les Blackstock aided in the drafting of note-cards. The Wade dossier is clearly a green loose-leaf binder. There is no red velvet binding as claimed by Edmonds and Eidinow. Frank Brady’s description of the dossier in Endgame is more accurate, apart from color. 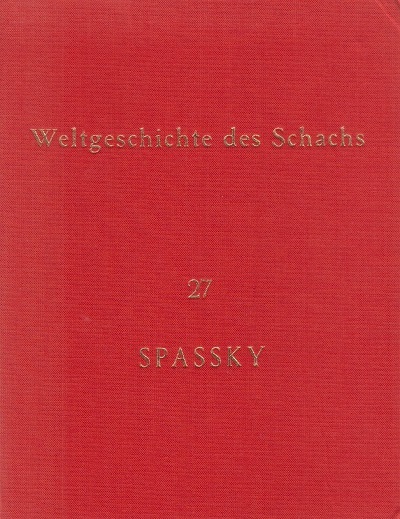 Donaldson also discusses Fischer’s use of the Wildhagen Spassky book (location 6287). 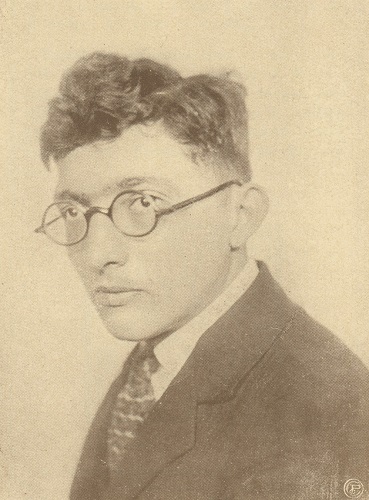 Again, he provides an image (see the above Hall of Fame link) and states that Fischer received an advance copy from the publisher in 1971. 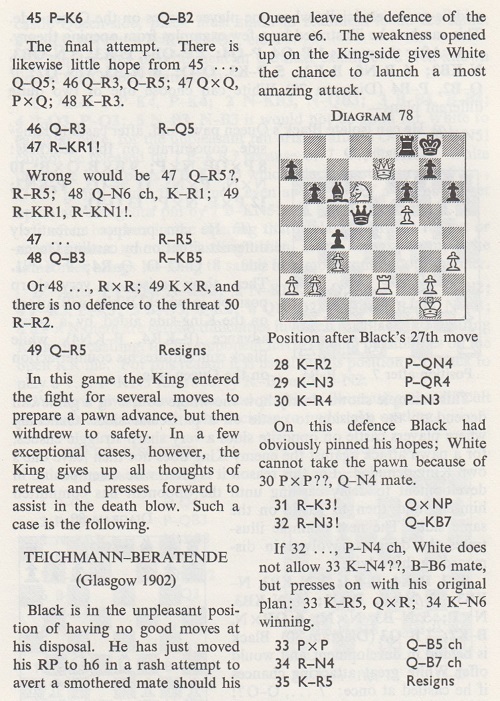 The subsequent section, featuring Fischer’s unseen notes to Spassky’s games, is irresistible. 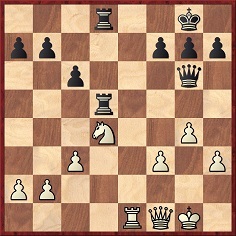 Wanted: earlier appearances of this position, with or without mention of 1...Rg7+ for Black. 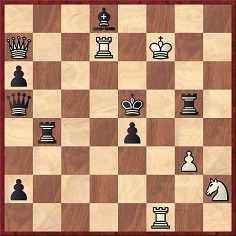 21 Nf6+ Kf7 22 Ng4 Ke8 23 Nf6+ Kf7 24 Nh5 Kg8 25 Nf6+ Kf7 Drawn. 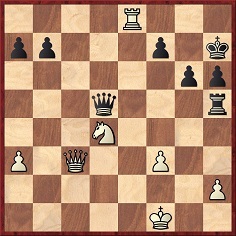 13...Rae8 14 Ne5 Qf6 15 Qxb4 Rxe5 16 Rf1 Qh4+ 17 Rf2 Qxh2 18 Qxc3 Qg1+ 19 Rf1 Rxe4+ 20 Kd2 Qxf1 21 Qxg7+ Kxg7 22 White resigns. 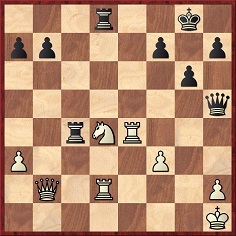 19 Nxf5 Qg6 20 Rxe6 Rxe6 21 Bc2 Qe8 22 Nxd6 Re1+ 23 Rxe1 Qxe1+ 24 Qf1 Qxf1+ 25 Kxf1 b5 26 Nf4 Nd7 27 Ng6 Rb8 28 f4 Nf6 Drawn. 15...Ke7 16 f4 Kd7 17 f5 Bd5 18 Bd2 Rae8 19 Rae1 Rxe3 20 Rxe3 Bxa2 21 f6 gxf6 22 Nf5 Qb3 23 Qxb3 Bxb3 24 Rg3 Rf8 25 Nh6 Bc2 26 Rg7+ Kc8 27 g4 Ne5 28 Bf4 a5 29 Bxe5 fxe5 30 h4 a4 31 Nf7 a3 31 White resigns.